Support for 1.7.10 was dropped by the Matter Overdrive devs when they moved up to newer Minecraft versions. I however wanted some additional features added to the mod. 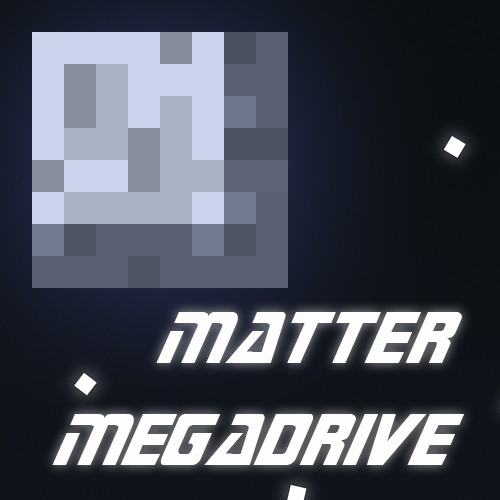 Matter Megadrive is a fork of Matter Overdrive with the additions I wanted to make. Rogue Android name labels can be disabled with a config option. Internal code has been cleaned up a bit to ease future development. when is the new update comming? hello again, i have an issues with something. the gravitational anomaly is making the server lag and make people crash or freeze if the get to close to it, at least when it gets bigger. hey again. i just wonder. is there any way too disable that people kill those mobs in the chat? it comes up everytime someone kill anything from this mod. cool :) if that happens, i'll be waiting for it ^-^. Thank you for not letting this mod die. Do you have any plans as to what you are going to do with it? For the moment I'm planning on figuring out what all the things in the mod do and fixing a few bugs I found. After that I want to give players more options for customization and adding a few sci-fi items (there's Romulan ale, but no blood wine or kanar? Unacceptable!). Also, no Disruptor Weapons and no Bat'leths.... and well... yeh. just one question, this mod is more or less just the same as matter overdrive right? i want it in my modpack cause some people want it, so i just wanna know that. and does it work good now on a server? Hi, thanks for you interest in Matter Megadrive. Right now, the mod is almost exactly the same at Matter Overdrive. i will of course report if i find any problems with the mod. Trying it out now. Here is a IDEA tho make a config option so you can change how long the abilitys last for like the shield I would like to last for a lot longer.